This article examines different types of dowsable fields associated with ancient sites. It is an interim report, to encourage discussion, on current work-in-progress relating to categorising dowsable fields, and, as such, covers only part of the subject matter. (For a fuller picture this article should be read in conjunction with publications covering other dowsing topics such as the physics of auras associated with physical bodies (eg reference1) ), as well as experimental findings for thought generated dowsing (eg reference 2)). So why categorise? Historically, progress has been made in understanding science by such analysis. For example, categorising the ninety plus elements occurring in nature into The Periodic Table helped in the simplification and understanding of chemistry. (In this case, the properties of each element were simply determined by the number of protons in its nucleus, being balanced by the corresponding number of orbiting electrons, which form periodic shells.) During the last century, cataloguing the plethora of “fundamental particles” led to the understanding of the Standard Model of sub-atomic particles, which, for example, include quarks. Even in biology and botany, categorising over many years into 3 or 4 levels of similar plants and animals has proved invaluable in research, and furthered the study of evolution. It is therefore hoped that adopting a similar approach here will lead to a simplification of the nebulous subject of dowsing and Earth Energies. This in turn should produce greater insights and, in particular, further comprehension of consciousness, perception and interaction with the Information Field. There is much well-established literature and knowledge regarding ancient sites. This has included studies of their layouts, geometry, and architecture which often involve circles or flattened circles of megaliths, banks and ditches. There have also been many published studies into the dowsable fields within ancient sites, which are often interrelated to local geology and a complex pattern of associated underground water systems. The latter have often been either the reason for locating the site in that position, or alternatively, the effect of building the site has “attracted” water. However, in nearly all cases neither wells nor drilling are undertaken to demonstrate that there are actually underground water-courses causing the detection of dowsable fields. It is not the intention of this article to repeat any of the above discussions. The objective here is to investigate the dowsable geometry of ancient sites, and highlight a few effects that are not well documented elsewhere, but are relevant to the theme of this article as set out above. that the local ground and its shape have a fundamental effect on perceived dowsable fields. It has been demonstrated that the mass, substance, and geometry of any dowsable object affect the Information Field. In turn, the brain interacts with the Information Field and perceives different types of dowsable fields and their associated geometry. Ancient man, living intimately with nature in a rural unpolluted environment, seems to have been able to feel these fields intuitively without the need for modern scientific analysis. As will be explained in this article, banks, ditches, megaliths, and archaeological sites seem to generate 4 different types of dowsable fields. These are illustrated below, and are simply referred to as Types 1, 2, 3, or 4. Although worldwide there are probably thousands of ancient sites, two typical ones have been selected to illustrate the findings in this section of the article. Examples of the simplest ancient sites without megaliths include Hengistbury Head (in Bournemouth), Wareham Wall and Maiden Castle. (Although these sites are located in Dorset there are numerous other sites elsewhere with similar dowsable fields). These ancient sites have been cited as examples because they are primarily defensive locations as opposed to ritual sites, with the advantage of having no associated megalith architecture and hence being easier to study. Hengistbury Head has an additional advantage in that the double dykes and ditches are in a straight line, (which conveniently runs approximately North/South), whereas most other sites are circular, i.e. the geometry for Hengistbury Head involves linear dowsing patterns, which are simpler to comprehend. Hence Hengistbury Head has been used for illustration and analysis. Figure 1 is a cross-section of Hengistbury Head. The area marked A is possibly a ditch that may have existed for some of the history of this site, but does not exist now. B is the most westerly bank, whilst D is the other but taller bank, (or the other double dyke). C is the ditch between the double dykes. 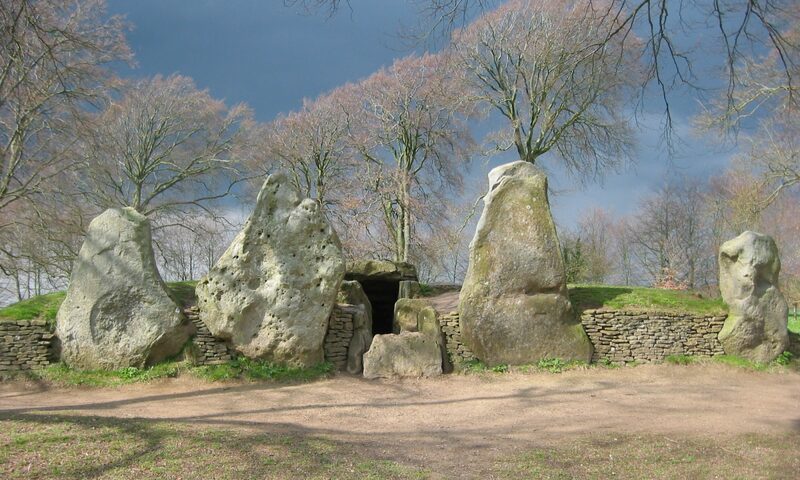 Sites such as Avebury, Stonehenge and numerous others have the well-known megaliths, but also have associated banks and ditches. Avebury’s accessibility, its pleasant surroundings, and comprehensive topics to study, make it the other suitable example. Figure 4 represents different cross-sections of the bank and ditch around the centre of the south-west quadrant of Avebury Rings. The first and most noticeable dowsable fields are continuous lines comprising 7 bands either side of the banks and ditches. All these have in common two sets of lines, each comprising 7 dowsable lines running parallel to the bottom of the ditches. In the case of Hengistbury Head, one set of 7 lines runs parallel to the east of the double dykes while the other set of 7 bands runs parallel to the west. Figure 1b is a cross-section of the double dykes and indicates the approximate positions of these dowsable lines, which henceforth will be termed Type 1 fields. Figure 2 contains measurements of these lines. (From a practical point of view, when commencing to undertake measurements, it is initially not obvious where the centre of the two sets of 7 bands is located, especially as the lines are not usually symmetrical. Until the layout of the site has been dowsed it is not known where to take the origin of one’s measurements. Initially, it is necessary therefore to take a convenient reference point from which to measure. In Figure 2 column A, an arbitrary origin has been chosen as Band 1 to the west. In Figure 2 column B, the origin of the measurements has been transposed to be the centre point between the two bands marked 1 and –1, whilst Figure 2 column C takes the origin and centre point between the two outer bands indicated as 7 and –7). Figures 3 a, b, and c give the ratios of the measurements between adjacent bands in an attempt to find a mathematical relationship, be it an arithmetical series, a geometric series or a harmonic series. In general, no pure mathematical series exists for all 14 lines, but the derived values in Figure 3c are nearest to an arithmetic series (equal spacing) for the westerly group of seven lines. Lack of symmetry is apparent between the two set of bands. It must be appreciated that perfect mathematics is unlikely, possibly because all ancient sites have had over three thousand years of decay and destruction. For example, at Hengistbury Head one of the ditches has been filled in, the height of the banks and depth of the ditch are less than when built, with the angles of the banks and ditch being shallower as a result of natural erosion. Moreover, the banks have been destroyed in several places by man, as well as experiencing extensive erosion by the sea. In the case of Avebury, the 7 Type 1 bands are contained in the inner or first ditch nearest the stones and the large bank on the other side. These 7 bands are parallel to, and centred on the bottom of the ditch as illustrated in Figure 4(a), which is the cross section of the ditch. These observations were made between stones 17 and 18. A characteristic of Type 1 dowsable fields is that they seem to involve gravity, and electro-magnetic fields, the latter including in particular, magnetism and photons. For defensive sites such as Hengistbury Head, these earthworks would not have been a significant defensive fortification for a determined army, especially with an outer ditch. One possible explanation for the motivation that drove Stone Age and Bronze Age man to build such extensive banks and ditches was that the 7 bands created would have been detected intuitively, and perceived by any attackers as identical to the human auras of an army of defenders poised hidden on the inside of the banks. Human auras have similar characteristics to the fields produced by banks and ditches, and both are detected as having seven distinct dowsable fields. Ancient man was more aware of dowsable fields and earth energies than modern urban man, and this illusion and deception would probably have had a far greater impact then than today. The next type of dowsable lines is a single continuous line that runs along the edge of a rim round a ditch, or along the top of a bank. Figure 1c is a diagram indicating where the Type 2 line is positioned in relation to the Type 1 lines and the banks and ditches at Hengistbury Head. As an example of two such Type 2 lines at Avebury, Figure 4b is a cross section of the ditch and bank between stones 17 and 18, where these lines are marked A and B . Figure 6 gives in tabular form the characteristics of these continuous lines. Columns A and B relate to Avebury, column C relates to Wareham Wall, and column D refers to Hengistbury Head. The heights of dowsable fields associated with banks and ditches produce an interesting mathematical relationship. This is detailed in the excellent article produced by Bob Sephton (Reference3). Figure 7 gives a cross section showing the diamond shape of the continuous line with the lower apex slightly below ground level, e.g. 330mm deep. A characteristic of these type 2 lines is that they do not appear to involve gravity or electro-magnetic fields. Further research into these lines should therefore prove exciting, especially as Type 2 fields are also found in auras of living plants and animals. Discrete spirals seem to appear at certain points at the top of a bank at separations of between 100 to 200 feet. Figure 8d illustrates the location of these Type 3 spirals in relation to the banks and ditches at Hengistbury Head. Figure 4c gives a cross section of a bank and ditch for Avebury. Figure 8 gives the characteristics of Type 3 lines. For Avebury, Spiral A was opposite stone 16, Spiral B was opposite stone 11, Spiral C was opposite stone 7. Spiral D was measured at Hengistbury Head at the most northerly part of the ditch. Figure 9 represents a vertical cross-section through the centre of these spirals, which are perceived as two cones with touching apexes at ground level. Type 3 spirals seem to interact with gravity, as well as the magnetic part of electromagnetic fields. The continuous lines discussed here are different to those discussed above under Type 2. Figure 1e gives the relative location of the single Type 4 line in relation to the other dowsable features of the double dykes at Hengistbury Head, where it is more easterly than lines Types 2 or 3. Figure 4d gives a cross section of the locations at Avebury where two distinct Type 4 lines seem to exist. Intriguingly, these are adjacent to the Type 2 lines discussed earlier. Line marked A is at the top of the rim between the stones and the first ditch whilst line B is at the top of the bank. Figure 10 gives the characteristics of Type 4 lines. Columns marked A and B relate to the lines just described at Avebury, whilst column C relates to a similar line measured at the northernmost section of the bank at Hengistbury Head. Type 4 lines, like Type 2, do not appear to interact with either gravity or electromagnetic fields, and also seem to be associated with remote dowsing. Unlike Type 1 lines, they are not slow. They give the impression of “instantaneous cohesion”, “space-time connectivity” (concepts that people studying quantum physics will readily relate to, but still do not understand after over seventy years of research), or “tachyons” or “chronons” using Russian terminology. Whatever the name, the concept is the same and relates to communication much faster than light, or even instant. Although not necessarily ancient sites, dowsable ley lines are very common and they usually come in groups of continuous parallel lines. Common groupings of these parallel lines are 3, 5, or 12. Figure 11 (a snap-shot in time on 9th September 2001) gives the spacing and measurements for part of the ley line that goes from St. Catherine’s Hill via Christchurch Priory to the top of Hengistbury Head. It comprises three parallel lines with the direction of the outer two lines going southwards while the inner line goes northwards, but as with most Earth Energies these directions reverse over the course of a year, as do the widths of the lines and other characteristics. The field strength of the inner line was measured at 74 (on an arbitrary scale of 1 to 100), which was almost double the field strength of the outer individual lines (measured at 36 and 39 respectively). On the day of measurement, the perceived colour of all three lines, using a Mager disc, was ultra-violet, whilst the dowsed field of the inner line was felt to be detrimental and for the outer two lines was beneficial. In general, the dowsable characteristics of these ley lines are similar to Type 1 fields. Archaeological sites that include such things as burial mounds, remains of huts or more substantial buildings, or other evidence of human occupation seem to produce Type 1 and Type 3 fields. For example, burial mounds are often sited over downward Type 3 spirals (to assist the deceased to go down into the Earth?) whilst temples in ancient Greece were built over upward rising Type 3 spirals (possibly a Mother Earth birth psychology?). These are examples of natural Earth Energies being used intuitively by man to determine the locations of sites relevant to their culture. Archaeological remains caused by human intervention, such as foundations of walls, are often Type 1. All the above dowsable fields seem to be produced purely by the local environment, ditches and banks, but not by megalithic stones. Ancient sites that comprise megaliths as well as ditches and banks have all of the above dowsable patterns and characteristics, but also include the following effects which presumably are produced by the stones. Like all dowsable objects, stones have auras, the size of which is a function of their mass. (See reference4). In the case of megaliths their core aura could extend over several yards. The inner parts of auras are Type 1 fields, whilst Type 3 spiral fields seem to form their outer geometry. The speeds at which these Type 1 fields are perceived to travel are relatively slow; at about 6 metres per second, (see reference5). (a) Two energy lines forming diameters through the centre, that run approximately north-south, and east-west, are probably caused by water flow. These lines seem to posses the characteristics of Type 4 fields. (b) An upwards, clockwise, Type 3 spiral at the centre of the stone circle, is most probably caused by the interaction of the above two energy lines, as is normal at such points of intersection. Some literature claims the central spiral is due to rising water, or to an ancient wooden centre post supporting a centrally located building. (c ) Type 1 energy lines appearing to form a pattern of four inner circles and a fifth circle, the latter being about 2 feet outside the ring of stones. The author is grateful to Jim Lyons and Bob Sephton for pointing out the existence of vertical “diamond” patterns that are further researched here. On a plan of the ground, these diamond shapes appear as spirals. Figure 14 is an example of the location of such a dowsable diamond/spiral shape found, for example, in front of one of the most southerly stones in the South-West Circle at Stanton Drew (which is near Bristol), and on a diameter through the centre of the circle to the most northerly stone. (The same dowsable shape is found in front of other diametrically opposite pairs of stones, eg in the example in section 9 below). Point X in Figure 14 is equidistant from the surface of the stone and the boundary of the core aura, and marks the centre of the diamond shaped field. In this example the radius of the core aura is 2a plus the radius of the stone, and point X is the distance a from the surface of the megalith. In addition, on measuring the distance between two such diamond shapes diametrically opposite each other, and comparing this to the diameter between corresponding opposite stones, a ratio of 4 to 5 is often found. Figure 15 illustrates that, unlike Figure 7, where the cross-section of Type 2 lines is diamond shaped, this “diamond” pattern really comprises two vertical conical shaped spiral fields, a clockwise one going up and an anti-clockwise one going down. These cones are conceptually connected base to base, and not apex to apex, unlike Figure 9, which represents Type 2 fields. The upward clockwise spiral seems to be associated with an electro-magnetic field and displays Type 3 characteristics, whilst the anticlockwise downward spiral seems to display Type 4 characteristics. However, on some occasions (eg for some stones at Avebury) this phenomenon dowses as Type 2 fields. Similarly, it is not clear whether each cone comprises a seven turn spiral or one of three and a half turns. Figure 16 is a horizontal plan looking down on a possible 7 turn clockwise spiral option, but it is not clear in practice, as opposed to theory, which mathematical series if any, each turn of the spiral forms in relation to the previous turn. These are obvious areas for further research. The author is grateful to Jim Lyons for pointing out the existence of figure of eight patterns that are further researched here. Figure 17 is again an example from Stanton Drew and relates to the most westerly standing stone in the Great Circle (but this effect could equally relate to other megaliths and sites). The centre of the figure of eight is a distance of 3a from the surface of the megalithic stone, or a distance a from the boundary of the stone’s core aura, ie one and a half times the distance of the core aura. There appears to be a flow of energy round the figure of eight as shown in the diagram. This pattern is known as the “Lemniscate of Bernouilli”, and seems to display the characteristics of Type 4 fields. Ancient man must have learned intuitively that creating banks and ditches, with or without circles of megaliths, produced different perceived fields which nowadays are detected by dowsing. On analysing these fields and categorising them, not only are 4 distinct geometric shapes discovered, but each dowsable field seems to be associated in different ways with the fundamental forces in nature, such as gravity or electro-magnetism. Hence, the plethora of Earth Energies and the complexities of numerous dowsable fields may possibly be simplified into only four different causes within one overall effect. What seems to be emerging from this research is that these perceived geometric shapes are not necessarily tangible or “physically” present in the locations where they are detected. Nor is it possible in conventional nature to have large-scale, well-defined geometric shapes with precise boundaries, and with fields that do not fade gradually, but cease to exist suddenly. In summary, what seems to be happening is that, possibly at the quantum level, an ancient site (like all dowsable objects), interacts with the Information Field (sometimes referred to as “the psi-quantum field”). This disturbance of the Information Field, in turn, is detected by the brain. However, the brain interprets these micro changes in the Information Field in an analogous manner to macro, life sized holograms, and interprets the effect as lines and geometric shapes superimposed on the local physical and tangible surface of the Earth. Each of these four types of dowsable fields not only requires independent verification, but also should be a subjects for further experimental and theoretical research. In particular, Type 4 and possibly Type 2 fields warrant special attention as they may be associated with remote dowsing, and controversially, with communications faster than light, or instant space-time connectivity. Thanks are due, in general, to the Wessex Dowsers, the British Society of Dowsers, the Dowsing Research Group, and the BSD Earth Energies Group, all of whom have helped in opening up the mind of the author to the importance, extensive scope, and power of dowsing and its many facets. In particular, acknowledgements are due to Bob Sephton, Jim Lyons and several other members of the Dowsing Research Group who have helped the author verify some of the findings in this article.